I recently took some time off to look after a grandchild with chickenpox, and it was borne in on me how much things have changed even during my lifetime. A mere half century or so ago all children in the UK could expect to catch measles, mumps, whooping cough, German measles, chickenpox, and possibly scarlet fever or rheumatic fever, and to be vaccinated only against smallpox and diptheria. Many would die from polio and meningitis. Only when I was almost out of primary school did the Salk vaccine arrive from America to immunise against polio, which my sister had caught as a baby and I too had probably suffered from. In secondary school I was vaccinated against TB and tetanus, and already antibiotics were available to fight bacterial infections and pneumonia, saving many lives. My Scottish great grandmother lost only one of her twelve children – little Catherine died at eleven months of Cellulitis, Septicaemia of the arm an infection probably resulting from a small scratch or insect bite, which now would be easily treatable. Now every child in the West, and many in the developing world, can expect to be vaccinated against virtually all of these childhood diseases and new vaccines are coming on stream all the time. However we should beware of becoming complacent since antibiotic resistance is becoming more and more common, and if it becomes entrenched we may find ourselves in a similar position to the parents of small children in 18th-century Jamaica. There was for a time a strand of academic thought that claimed that because infant mortality in the past was so high, and so many pregnancies and infants were lost, that parents were inured to it and did not care for their small children unprepared to make any ‘investment’ in them until they grew up and were likely to reach adulthood. I really do not believe this. Take for example the death of little Charles MacKay, which was mentioned recently on the Facebook group of the Jamaica Colonial Heritage Society, following the discovery of some marble tomb fragments from a site that had been bulldozed. The gravestone had sadly been lost but it had previously been recorded and so we know that so precious was little Charles Mackay that he was not recorded as being simply two years old at his death but precisely two years five months and twenty-seven days. Browsing through Philip Wright’s Monumental Inscriptions of Jamaica (Society of Genealogists 1966) shows that many children were commemorated with their ages given to the day in this way. It is hardly surprising that parents, faced with the repeated loss of children born in the British colonies, sent them back to Britain in the hope that their chances of survival would be greater. This was a practice not only among 18th-century Jamaican parents, but one which continued throughout the nineteenth and into the early twentieth century. My own grandfather and his siblings were sent back from India to school in England, not because the schools were so much better but because their health was likely to be improved. More heartbreaking was the position of Lady Nugent, whose diary of her Jamaican experiences is well known. Having apparently lost several pregnancies she had two children born in Jamaica with whom she returned to England. When they arrived her health had been so debilitated that she weighed a mere six stone, and when subsequently her husband was posted to India she left her four surviving children including a five week old baby behind in England for the sake of their health. And later she wrote, This book I shall seal up, and send to Westhorpe to be put into the desk, that is in the little breakfast room, where my dear children may find it, one of these days, should I not return; and along with it various little articles, as keepsakes, which they will value, I am sure, as relics of the father and mother, devoted to their interest and welfare. The Nugents did return safely to England and spent the rest of their lives with the four of their children who survived to grow up. Because of their social position and Lady Nugent’s Journal we know more about them than about many of Jamaica’s colonists and their children. Often we can only deduce the deaths of children when we read a Jamaican Will that leaves an estate to nieces and nephews, distant cousins or friends, from which it can be assumed that no immediate heirs had survived. Such children were often buried on the planter’s estate in a family plot and it was not uncommon for the grave to be unmarked, the grave marker lost or the death and burial to have gone unrecorded in the parish register. This makes it difficult to estimate levels of child mortality. How much more difficult is it to estimate mortality among Jamaica’s slaves and their children, particularly in the earlier part of the 18th-century for which fewer plantation records survive. What can be said with certainty is that malaria, smallpox, yellow fever, measles and other infections killed adults and children alike. Poor hygiene and a lack of knowledge of how infection was spread, or understanding of the role of mosquitoes in transmitting malaria and yellow fever, meant people were unable to take preventive measures and survival was often due to luck rather than a strong constitution. 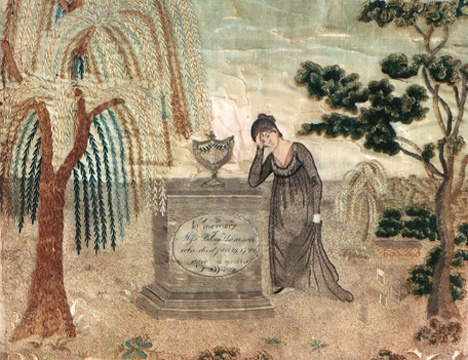 Lady Nugent’s Journal of her residence in Jamaica from 1801 to 1805. New and revised edition edited by Philip Wright, Institute of Jamaica, Kingston, 1966. With Lent fast approaching I thought it would be good to dip once again into the cookbook of Hannah Glasse to see how she made pancakes. 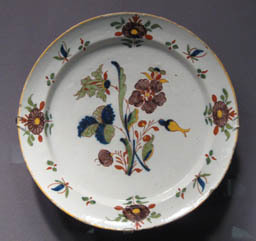 This is an 18th century Dutch dish such as Hannah Glasse might have used to serve up her pancakes*. Traditionally of course pancakes were made on Shrove Tuesday, when western Christians were shriven of their sins and used up foods they were forbidden to eat during the fasting period of Lent. Because the date of Easter is moveable so is the start of Lent, which this year begins on Ash Wednesday, February 13th. This time of year is also known as the ‘hungry gap’, when foods stored over the winter are running out and new spring crops have not yet come in. Hannah Glasse lists seasonal foods in her book and mentions a huge range of fish available during the winter – many now unavailable or ignored, including a surprisingly large range of freshwater species the fishing for which, of course, would not be so adversely affected by winter weather. She mentions dorey, brile, gudgeons, gollin, smelts, crouch, perch, anchovy and loach, scallop and wilks, periwinkles, cockles, mussels, geare, bearbet and hollebet. She also advises on how to chose for freshness salmon, pike, trout, carp, tench, grailing, barbel, chub, turbot, cod, ling, skate and thornback, sole, sturgeon, herring, mackerel, lobsters, prawns and more. Of January Fruits which are yet lasting, she lists some grapes, fifteen varieties of apples (most of which I regret to say I have never heard of) and five kinds of winter pears. In February she adds to the list the Pomery, the Winter Pipperning and the Dagobent Pear. Even in March, and with no refrigerated storage, she expected to have available five apple varieties and two pears. By April her list of available vegetables and salads is increasing and includes cucumbers, mushrooms and purslane grown on hot beds – making use of the huge quantities of manure available to 18th century farmers and market gardeners. We are not so used now to having to think seasonally about our food, but even in our relatively sheltered economy the UK is suffering some shortages due to having experienced an eighteen month drought followed by many months of exceptionally high rainfall. Farmers are still unable to lift root crops from saturated ground, two weeks of heavy snow meant crops such as leeks and greens could not be harvested, and until the ground dries out new seed cannot be sown as cultivation with heavy machinery only compacts the soil destroying its structure. In any case the ground is so wet that seed would rot if planted. Although food prices are pushed up by such conditions, the wealthy West can today afford to import food to make up any shortfall. It is worth remembering that 18th century Jamaicans too were heavily dependent on imports, despite the island’s potential for growing its own food, with planters preferring to give their land over to the monoculture of sugar, coffee and other cash crops. Some native foodstuffs, such as the green turtle, were exported to the profitable markets of London, and in the fifth edition of her book Hannah Glasse included lengthy instructions on preparing a turtle in the West Indian Way. This was for a turtle weighing sixty pounds! And so back to pancakes. Hannah Glasse included several pancake recipes in her book, most of which are far more generous with cream, eggs and butter than is fashionable now. Most use spices such as cinnamon, mace and nutmeg as well as sugar, and in the case of at least one recipe the quantity of nutmeg is quite large. If you are thinking of trying the recipes remember 18th century eggs would have been smaller than today, and spare a thought for Hannah when you reach for the packet of caster sugar. She would have had to shave her sugar off a Jamaican sugar loaf and to pound it with pestle and mortar to achieve the desired fineness; her nutmegs would have been bought whole and her cinnamon as curled bark, all to be grated and pounded by hand. Several of the recipes make use of ‘sack’ which was a fortified white wine approximating to a sweet sherry. It was imported into England, but would also have been imported into Jamaica from the Canaries which were on the shipping route for the outward journey of many of the supply ships. 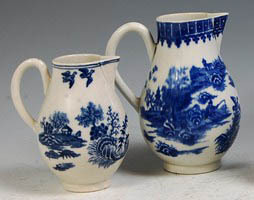 18th Century Cream Jugs recently sold by Lacy Scott and Knight. Take half a Pint of Cream, half a pint of Sack, the Yolks of eighteen Eggs beat fine, and a little Salt, half a pound of fine Sugar, a little beaten Cinnamon, Mace and Nutmeg; then put in as much Flour as will run thin over the pan, and fry them in fresh Butter. This sort of Pancake will not be crisp, but very good. Take a Quart of Milk, beat in six or eight Eggs, leaving half the Whites out, mix it well till your batter is of a fine thickness. You must observe to mix your Flour first with a little Milk, then add the rest by degrees; put in two Spoonfuls of beaten Ginger, a Glass of Brandy, a little Salt, stir all together, and take your Stew-pan very clean, put in a piece of Butter as big as a Wallnut, then pour in a Ladleful of Batter, which will make a Pancake moving the Pan around, that the Batter be all over the Pan; shake the Pan, and when you think that side is enough, toss it, if you can’t, turn it cleaverly; and when both sides are done, lay it in a Dish before the Fire, and so do the rest. You must take care they are dry; when you send them to the Table, strew a little Sugar over them. Take a Pint of Cream, six eggs, three Spoonfuls of fine Flour, three of Sack, one of Orange-flour Water, a little Sugar, and half a Nutmeg grated, half a pound of melted Butter, almost cold; mingle all well togeether, and Butter the Pan for the first Pancake; let them run as thin as possible; when just coloured they are enough: And so do with all the fine Pancakes. Interestingly her pancakes seem mainly to have been served on their own with sugar rather than with sweet or savoury fillings.